Sanctity of Marriage? Gay "Marriage" a Great "Business Opportunity." Read this! Two Oregon City women who describe themselves as friends and business partners rather than lovers filed for a civil union today in Clackamas County, saying the arrangement would help protect their business. 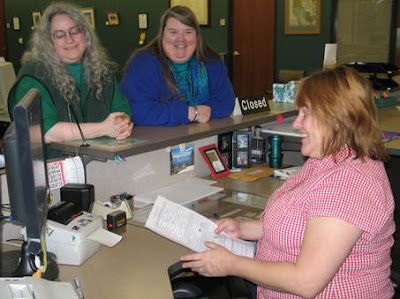 “We’re just opportunists,” joked Leska Emerald Adams as she applied for a civil union with her companion, Lynn Szender, at the Clackamas County clerk’s office. As Adams, 47, and Szender, 51, explain it, they are bound by a “divine friendship” that is reinforced by the live-in caregiving business they own and operate together. “We’re not lesbians,” Szender said. A civil union will help protect their business. The formal bond means that that, if one of them dies, the other can take over the house, without worrying that her partner’s grief-stricken family will intervene, they said. The union also means that Adams can share her partner’s medical benefits. When she’s not working at her home business, Szender is the director of health services at Mary’s Woods Retirement Community in Lake Oswego. Three years ago, Adams and Szender bought a home in Oregon City. They painted it with vibrant colors, inside and out, landscaped the grounds with flowering plants and more than 300 trees, and hung feeders to attract songbirds. “We’ve created the garden of Eden,” Adams said. In this homemade paradise, the women provide around the clock rehabilatory and hospice care, treating one elderly patient at a time. Please email victoria@kpam.com to get yours when they’re available. Or go here. Illegal Legislative Sessions, Illegal Aliens, Gay Marriage. Gee, Why Wouldn’t Anyone WANT the Legislature to Meet Every Year? The so called emergency that allows the legislature to meet in this illegal session is over giving illegal aliens driver’s licenses and putting cops on the roads. Those are two things that came up in the previous two sessions. It could only be construed as an emergency because democrats have dragged their feet for years. Please. They think that we’ll come around with the idea of a yearly legislative session if we just let them do it illegally. No, they actually think this because they think you’re too stupid. I’m not opposed to a yearly session as long as they aren’t allow to make laws at both of them, that legislators do not get full time PERS status, they remove an old law for every time they make a new law, PLUS one session is one month long in which they hammer out a budget and the other is policy setting. Period. They should propose this and it should be put in the Oregon constitution. Included should be a device like the Washington State legislature has in which every time legislators propose a bill that spends moneythe legislative fiscal office provide emails interested parties the ten year cost projections. CHECK OUT MCCAIN’S HORRIBLE ILLEGAL IMMIGRATION VOTING RECORD RIGHT HERE.